Ergoweb's Peter Budnick details his views on the emerging debates surrounding the relationships between ergonomics, a field he believes is fairly well defined, and wellness, a concept that is not well defined, though intuitively appealing. "Ergonomics and wellness complement each other, but they are not one and the same," he concludes. This article originally appeared in The Ergonomics Report™ on September 26, 2012. I was reminded [in September 2012] of the wide range of perspectives regarding the depth and breadth of the field and practice of ergonomics, and what the term “ergonomics” means. This discipline draws practitioners and researchers from a variety of affiliated fields, such as engineering, psychology, safety, human resources, and many healthcare specialties, including therapists, MDs, DOs, DCs and nurses. Each perspective comes to ergonomics with a great deal to offer. Sometimes individual practitioners or groups with a shared perspective bring a strong sense of ownership over the meaning and interpretation of the term, which can “ruffle feathers” or offend other stakeholders. I was reminded of this by the emerging debate surrounding the relationship between ergonomics and wellness, exemplified by articles like CPH-NEW Responds to “Wellness: Why Ergonomists Need to Get Involved (Reprint)”. Through this article I’ll contribute some of my own thoughts and concerns on the topic, because I think it’s important to the future and effectiveness of the field. Another perspective came to me from a group of dedicated professionals I work with in an ergonomics-related non-profit. In a discussion surrounding a definition for ergonomics, the consensus seems to be that no definition is complete if it does not include the word “design,” and that at its core, ergonomics is really a design science. This is not a new perspective, and is deeply rooted in the evolution of the scientific and professional discipline. In a broad sense, this perspective supports the concept that ergonomics does and should focus on designing equipment, processes and environments to accommodate human limitations and enhance human capabilities. 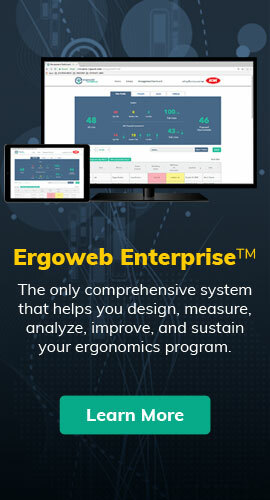 On another branch of the multi-dimensional spectrum of perspectives, Ergoweb was contacted this week by two different developers of stretching related software, each hoping we would promote, purchase or sell their products. I’m really torn on the topic of stretching and it’s relationship to ergonomics. I recognize its relationship to injury prevention/management, and wellness, but struggle with it being included under the banner of ergonomics, because it seems to support the concept that we should modify the person, not the equipment, processes and environments. This seems contrary to the design perspective described above. I’ll discuss stretching in a future article. ... materials handling systems, unit load packaging and transportation processes are designed in a vacuum. One group rarely talks to the other. That leads to costly mistakes. … you may not think of a workbench as anything more than a piece of furniture, but if it’s not tied into your overall system, you create a bottleneck in your operations. In my experience, process bottlenecks are commonly caused by poor ergonomics, or become ergonomic concerns after humans are thrown — sometimes literally — at the process to manually overcome equipment-related bottlenecks. One of the first questions I ask when reviewing a process is “where are the bottlenecks,” because I know that’s where I’ll also find ergonomics concerns. This is something traditional ergonomists have trumpeted for a very long time, that ergonomics is a systems science, and organizations must take a systems approach if they wish to identify and solve root-cause problems and achieve real, measurable, sustainable improvements. Since Tribilcock uses the word ergonomics in his article title, it implies that it is a given in his mind that ergonomics is a systems design approach that reduces waste and improves process and organizational performance. I like that, because it suggests our contributions are being recognized as an asset rather than a liability in the material handling industry. Ergonomics is a term thrown around by health professionals and marketing mavens with a cavalier attitude. For some it has a very specific meaning. For others it covers everything under the sun (Chris Adams, About.com Guide). He then proceeds with commonly accepted definitions. That one captured some of my concerns with blurring the meaning of ergonomics and tying it too closely with the broad concept of wellness. Count me as one who believes that the term ergonomics has specific meaning. I also think restricting descriptions of ergonomics to work and workplace issues only is far too narrow a perspective. If you view it from the design perspective, ergonomics is applicable to all facets of the human experience — well beyond the workplace. The marketplace for ergonomics, however, currently tilts heavily toward workplace ergonomics, and specifically toward the prevention and management of workplace musculoskeletal disorders (MSDs). And herein lies a big problem, from my perspective: MSDs are only one concern for professional ergonomists. There’s nothing wrong with such a focus, because we bring a lot of value to that specific concern, but such a singular focus can also marginalize our role and restrict our ability to deliver the greater value our comprehensive, systems approach to human and organizational performance can bring. Furthermore, even if we do restrict our inputs to workplace causes and contributors to MSDs, ignoring lifestyle and personal contributions is simply not the comprehensive, systematic approach we promote. This was recognized by one of our readers, “Zogman,” in his comment to my recent article, Review of Hand/Wrist/Arm Ergonomics Job Analysis Methods: Part 1, and also appears to be at the root of a trend to bridge ergonomics with wellness. After all, we promote a systems approach, so why not recognize that MSDs are more than a workplace issue? Interestingly, there is no universally-accepted definition of wellness. There is, however, a set of common characteristics seen in most thoughtful attempts at a definition of wellness. And I thought defining ergonomics was challenging! In comparison, ergonomics seems to be well defined by broadly accepted, if somewhat flexible definitions. Wellness, on the other hand, appears to have many meanings and interpretations that are subject to the context of application and the perspectives of the promoters. Wellness has intuitive appeal, but its specific meaning in science and practice remains elusive. The distinction, at least in my mind, is that certain root cause contributors can be directly controlled by employers, while others can’t, at least not in a civil society. The key word in that last sentence is “directly.” A company does have direct control over work height in an assembly task, for example, but does not have direct control over worker weight, fitness, etc., unless they were to implement forced fitness and diet programs, or worker selection methods based on personal factors, which would surely bring accusations of cruelty and discrimination in some countries. A company can influence personal factors by advocating wellness, but cannot directly control them like they can physical and procedural design. In the end, the debate comes down to this: Do ergonomists focus on changing the person, or changing the working conditions? Traditionally it’s been the working conditions, but there’s a limit to how effective we can be without also considering the personal and social factors. I think it’s great that ergonomics can be a valuable supplement to a wellness initiative, but I don’t think it’s a good idea to expand the definition of ergonomics to include something as broad and undefined as wellness. Instead, let them support each other, but keep ergonomics, and the public’s understanding of ergonomics, on the design side. I do applaud efforts to bring a systems ergonomics approach to groups like the NIOSH Total Worker Health (TWH) program and its wellness focus, such as those outlined by Laura Punnett, Robert Henning and Nicholas Warren in CPH-NEW Responds to “Wellness: Why Ergonomists Need to Get Involved (Reprint)”. Finding synergy between ergonomics and wellness — however we define it — is a recognition that the causes and effects of MSDs go beyond the confines of the workplace, and that an MSD prevention and management process must therefore consider personal, social and lifestyle factors. That’s all good, but it’s not all ergonomics, and I think we should be very careful about mixing the two. Ergonomics is not just about MSDs, and everything that impacts MSD rates and severity does not fit easily within the current definitions of ergonomics. Ergonomics leans strongly in the design direction, and wellness leans strongly in the behavioral direction. Ergonomics and wellness complement each other, but they are not one and the same. What Influences The Use of Lift & Assist Devices In Healthcare?